Clemson keeps charging David Barpal photo. Top to bottom, Lindenwood won, St. Bonaventure rebounded, and Dixie State lost, but still have impressed. David Barpal photos. The championship will be decided from these four teams: Lindenwood (St. Charles), Notre Dame College, Central Washington, and Clemson. Of these, only Clemson hasn't really competed for this tournament before. CWU won it in 2011. NDC finished 2nd last year. Lindenwood has come close a couple of times. 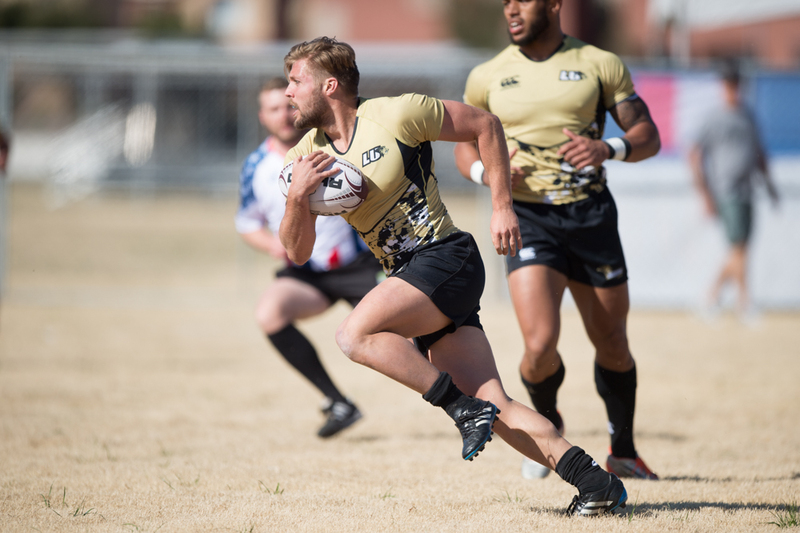 Lindenwood thumped their local rivals Lindenwood-Belleville 40-15 in today's quarters. 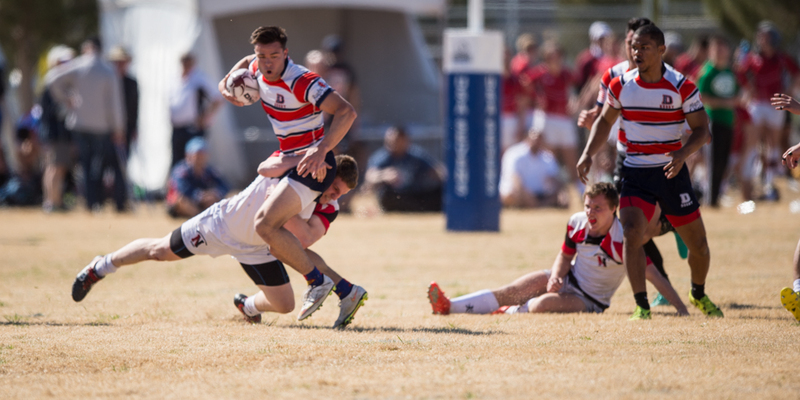 Clemson got tries from James Rogers, Liam Helstrom, and Colin Gregory, and held Santa Clara in check 21-5. Central Washington, which blew through the opposition on the first day, had to fight for it against a Dixie State that was a surprise pool winner yesterday. DIxies State's coach Scott Moffitt laughed at the fact they were picked to finish last in their pool. "We are just fine going under the radar," he said. "We didn't mind being in a tough tossup pool. We just hope to compete well [on Friday] and represent for our state and conference. 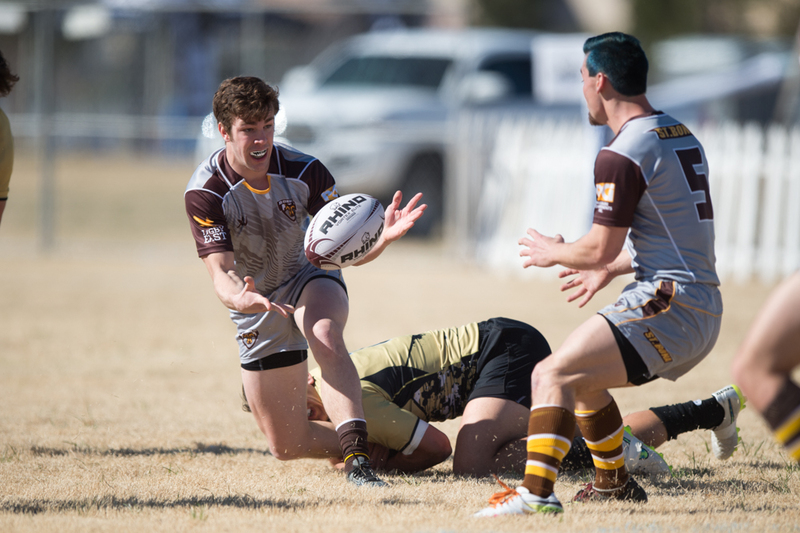 We have a lot of new players but some of our core group come from Snow Canyon and Herriman rugby. We are family and play for each other. So on the day it was a team effort from all individuals doing what they were supposed to do to make the next guy better next to them." In the Plate rounds, teams that felt they'd missed an opportunity had a chance to show their stuff. JMU (after getting the confirmation that they were in the Plate and not Tulane after clarifying with tournament organizers), hammered Colgate. Western Michigan, which competed well on Thursday, beat Northeastern 19-12. Grand Canyon got tries from Maceo Brown and Ricky Wisdom to lead 14-5 but fell behind 14-15 to Buffalo before Brown and Widsom did the same in the second half to pull out the victory. St. Bonaventure had to work for it against Montana State. North Westall's try was their only scoring in the first half, but second-half tries from Matt Bergstol, Stephvan Tanner, and Chaz Schwenk won it for SBU. Here are scores from Thursday plus updated scores from today's action.